Granit Xhaka is set to play his 100th match for Arsenal on Sunday and yet he still divides opinion among the club's fans. But his role is integral to the way new Arsenal head coach Unai Emery wants his side to perform. Emery is keen for his team to play out from the back and then pass through the thirds with speed and efficiency. The Spaniard has quickly recognised the importance of Xhaka’s precise distribution to this objective. Xhaka has been selected to start all five Premier League matches so far and Emery has handed him more minutes than any other Arsenal midfielder. Arsenal’s new man in charge is happy to see patience in possession, but where possible he encourages early passes into forward players. Pierre-Emerick Aubameyang, Mesut Ozil and Alexandre Lacazette all thrive off instant service that unsettles their markers. In this regard Xhaka is the main man. He has found Aubameyang and Ozil with 19 and 28 passes respectively, more than any team-mate. In fact, no one else at Arsenal comes close to making as many vertical passes that dissect the lines as the Swiss does. Xhaka was a little off the pace in the opening two matches of the campaign. But during his last three appearances there has been a huge improvement in his all-round play. His set-piece deliveries have been superb. He scored a fabulous 30-yard strike against Newcastle United and has displayed a command of the middle third. 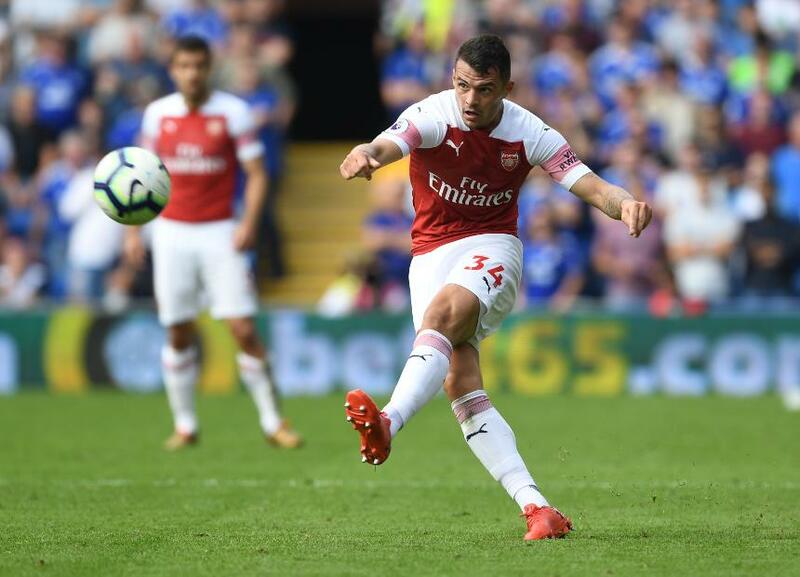 Arsenal fans will have noted that Xhaka has looked most comfortable alongside Lucas Torreira, a defensive specialist who relieves him of certain off-the-ball duties. This will possibly be the midfield partnership Emery opts for when his side entertain Everton on Sunday. Xhaka continues to have the occasional lapse in concentration, but his statistics stack up favourably with the Premier League’s leading midfielders. His ability to produce progressive passes far outweighs his faults. There has been a slight tweak in Xhaka’s positioning under Emery, compared with under Arsene Wenger. Emery likes his central midfielders to stick to their designated zones as much as possible, rather than asking them to cover the full width of the pitch. Stationed to the left of centre, Xhaka has improved his discipline and held to his head coach's instructions. Provided that he can dominate the central midfield in the way he did during the second half of last weekend’s win at Newcastle, the in-form Xhaka can have another positive influence on Sunday.